Can I replace a 2×4 common truss, with a 25 ft long bottom cord and 60 in from bottom of cord to peak of rafter, with a scissor truss? And could I still use 2×4 or would I have to go bigger? Unfortunately I cannot give a direct yes or no to this question, as there are so many variables that factor into the answer. Scissor trusses are quite strong actually, as long as you can adequately resolve the increased tension in the bottom chords and king post you could probably get away with it. 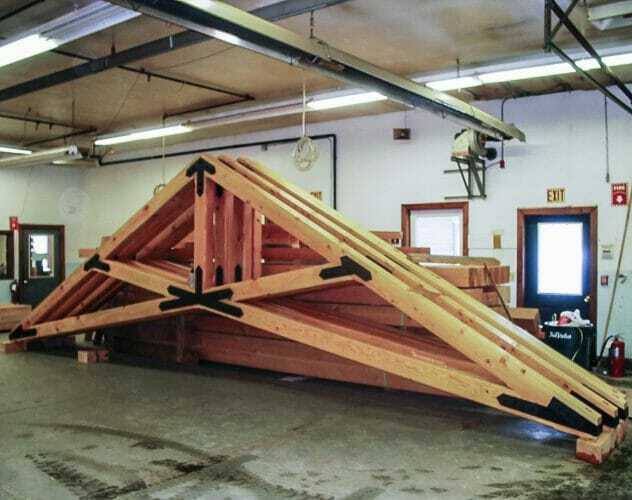 However, scissor trusses deflect significantly more than king post trusses (or common trusses) because you do not have the tension tie along the bottom of the truss. They act like a leaf spring in a car, the more load on the roof, the more they deflect both vertically and horizontally. Depending on your roof build-up and/or architectural finishes, that deflection may pose some problems. As to the size of the 2xs, that is dependent on the spacing, loads, grade and species of material, etc. I expect that if you can get away with a 2×4 common truss, 2x4s would also work with a scissor with 2x6s on the top chords, as they experience a little more stress in the scissor configuration. I would recommend contacting a local engineer who is familiar with the loads and can take a look at the plans to give an official approval, good luck!